Lady Gaga and wax are having a bad romance in Peru. The figure, which according to Billboard went up in a Lima, Peru museum last week, depicts Gaga in the infamous “meat dress” that the singer wore to the 2010 MTV VMAs. However, the major beef was among fans who felt that the stringy-haired, borderline-emaciated figure bore little to no resemblance to the “Born This Way” musician. “It’s a wax sculpture of an alien cockroach that murdered Lady Gaga and is wearing her skin,” suggested one critic. “How on earth did someone get PAID to professionally make a Lady Gaga wax figure that looks like THIS?” wondered another voice of disbelief. “That’s Donatella Versace ….,” suggested another observer. “Why does Lady Gaga’s new wax fixture look like she needs a Euro for a hostel?” asked another detractor. “Whoever made this wax figure need to be fired asap,” suggested another unsatisfied bystander. The Gaga figure joins a seemingly growing list of celebrity wax figures that have been met with social-media outrage and mockery, including figures of Beyonce, Ryan Gosling and Tom Brady. Americans bet billions of dollars annually on the Super Bowl, but not all of it is directly on the game itself -- or even anything to do with football. As the New England Patriots prepare to take on the Atlanta Falcons Sunday at Super Bowl LI in Houston, here are some of this year's more unusual prop bets. All lines are courtesy of Bovada. How long will it take for Luke Bryan to sing the national anthem? What color will Lady Gaga's hair be when she comes on stage for the halftime show? 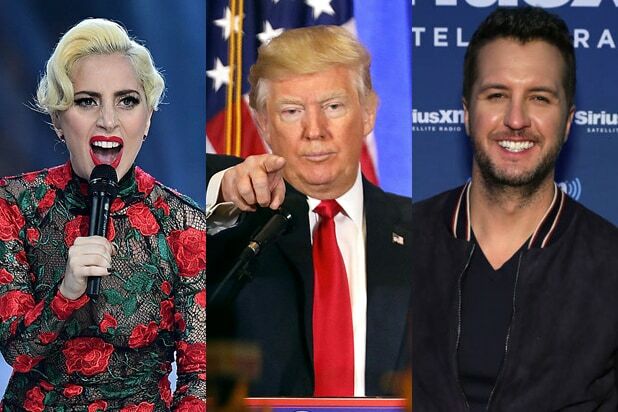 Which song will Lady Gaga play first during the halftime show? What will Luke Bryan be wearing when he starts singing the national anthem? Will "Houston we have a problem" be said on TV during the broadcast? How many times will Trump be said on TV during the broadcast? Will Luke Bryan forget or omit a word from the national anthem? See how all these bets paid off (or didn't).